A massive weather system is pummelling SA, but bringing welcome rain to drought-stricken areas. Follow all the latest details here. The Western Cape Education Department on Friday said that 135 schools in the province had been damaged as a result of the massive storm which struck earlier in the week. Education MEC Debbie Schafer said in a statement that learners and educators returned to school on Thursday after schools had been closed on Wednesday as a result of severe weather that hit the Cape for a period of almost 36 hours. “While I am pleased that for most schools, learning and teaching resumed almost immediately, there are a number of schools that were harder hit by the storm and as a result, teaching and learning may be suspended for a couple of days. Schafer said: “There are exceptions at some schools that have been severely damaged by the storm. Our district officials are working with schools to implement contingency plans. Schools have also reported water damage to classrooms, fallen trees and damage to fences. She said the head of the provincial department of Transport and Public Works had activated emergency procurement measures which would make provision for schools “to ensure, as quickly as possible, that facilities are made safe where damage has occurred and allow for minor repairs to prevent further damage to buildings”. She said schools needed to be made operational as soon as possible, which meant that authorities would have to prioritise damage that affected the core functioning of the school, such as damage to classrooms, ablutions and administration blocks. The department would fix minor damages as soon as possible she added. “Major repairs will take longer,” Schafer said. “These will need further investigation and procurement procedures. It is too early to assess the costs involved. Follow the latest about the storm in the live widget below. The South African Weather Service has warned Cape Town residents about “disruptive snowfalls” expected over the Cape Winelands on Thursday. According to Storm Report SA, another cold front over the Atlantic due to make landfall over the Western Cape was expected on Saturday. “This cold front will not be as big as the previous one but can still bring some moderate rainfall and moderate wind to the Western Cape. “We expect between 15 and 25 mm of rain over the low laying areas of the Western Cape and up to 50 mm of rain over the mountain catchment areas. Winds of up to 40 km/h is expected in places,” said Storm Report SA. The South African National Defence (SANDF) on Thursday said it would be deploying five helicopters to help with firefighting and relief efforts in the storm-hit and fire-ravaged areas of the Western Cape. In a statement, the SANDF said it would be deploying two Oryx helicopters and a BK 117 chopper to help firefighting efforts in Knysna. Another Oryx helicopter and a BK 117 helicopter would be ready to assist with emergency evacuation in storm-hit areas of the province. The chopper, were however, still grounded due to the weather. “Due to the wind speed and severity levels at the moment, all deployed air elements, civilian and military, are unable to take to the skies,” the SANDF said. The SANDF would also deploy troops to patrol Knysna to protect homes and businesses from looting in the evacuated areas. Between 8 000 and 10 000 people were displaced in Knysna, with many being accommodated in community halls. Parliament on Thursday extended sympathies to the friends and family of people who lost their lives due to the severe weather conditions that have battered the Western Cape this week. Speaker of the National Assembly Baleka Mbete, on behalf of parliament, also said parliament’s thoughts were with those who had lost their homes during the storm which hit Cape Town and the fire that is raging in the southern Cape at present. At least nine people have died in storm and fire-related incidents in the Western Cape over the past two days, while at least 250 homes have been destroyed in fires near Knysna. In a statement, Mbete also commended the emergency and other services for their work in managing the difficult situation and providing support to those in need. Parliament noted it was mostly the “poorest sections of our society that usually bear the brunt of natural calamities, such as severe weather conditions, due to the conditions under which they live”. The Western Cape Disaster Management centre on Thursday said eight people have been killed and thousands forced from their homes as South Africa’s tourist base Cape Town and surrounding areas were hit by the worst winter storm in 30 years. The storm is expected to dump more than two inches (50 mm) of rain in some areas and to trigger waves of up to 12 metres, the South African Weather Service said in warnings. People in shanty towns, who have previously had to cope with the region’s worst drought in a century, have been hardest hit, as floods and heavy rain washed away homes built of planks and zinc sheets. “Eight people have died so far in storm-related incidents and thousands have been displaced,” said James-Brent Styan, spokesperson for the Western Cape local government ministry. He said in one incident a family of four died in a fire caused by lightning. Another died in a building collapse. Local media reported that strong winds had fanned fires in the countryside east of Cape Town, forcing evacuations including in the popular resort town of Knysna, renowned for its oysters and rugged coastal scenery. Over two dozen fires were reported in the area, which are home to dense forests, providing plenty of material for the spread of wild fires. The army, police and other emergency services were on hand to evacuate anyone stranded by the storm and to provide emergency shelter and food. Schools in the Western Cape are expected to reopen on Thursday morning following extreme weather conditions, the Western Cape Education Department said. The department confirmed several schools were damaged by the rain and gale force winds which have battered large parts of the province. “A total of 22 schools reported damage by 2pm [on Wednesday]. The department expects to receive further reports as schools mop up on Thursday,” the department said in a statement. The department dismissed rumours that schools would remain closed for the rest of the week. Severe Cape Town weather conditions reportedly caused eight deaths by 5pm on Wednesday, the Western Cape government said. “Four fatalities were reported in Kraaifontein due to a fire caused by lightning, one fatality was confirmed in Lavender Hill due to a building collapse and three people died in fire-related circumstances in Rheenendal, outside Knysna in the Eden district,” provincial local government spokesman James-Brent Styan said in a statement. The stormy weather, which included heavy rainfall and gale-force winds in the Cape Peninsula and strong winds in the Southern Cape, continued on Wednesday night with more bad weather expected on Thursday. Roofs were blown off houses in the City, these include the Strand area, Kalkfontein, Delft, Mfuleni, Mandalay, while 15 people were displaced when their roofs were blown off in Imizamo Yethu in Hout Bay. Trees were uprooted, roads were forced to close and electricity to various areas was cut off as the monster storm coming in off the Atlantic coast hit the Mother City overnight. Gale force winds created havoc in the West Coast area where roughly 13 roofs were blown off houses, 45 informal dwellings collapsed and reported power failure occurred in Citrusdal as well as a roof of a crèche in Saldanha Bay blowing away. Eight people have been killed, with four of them in a fire caused by lightning on Wednesday in stormy weather conditions that have gripped different parts of the Western Cape since Tuesday night. The four were killed in a fire in Kraaifontein, while a 60-year-old man was killed after a home collapsed on him in Lavender Hill, News24 has reported. The storms were expected to peak anytime from lunchtime on Wednesday, the South African Weather Service warned. Speaking to The Citizen on Wednesday morning, forecaster Venetia Phakula said while there was a bit of moderation in terms of the freaky weather conditions, residents should just be prepared as the storm was expected to continue. “The possibility of the storm getting stronger later in the day cannot be ruled out at this stage, hence we appeal to residents to be prepared. “The alert that we have issued pertaining to the possibility of heavy downpours which could result in flooding also remains in place, and we are expecting showers and thundershower chances of between 60% and 80% on Wednesday [today],” Phakula said. 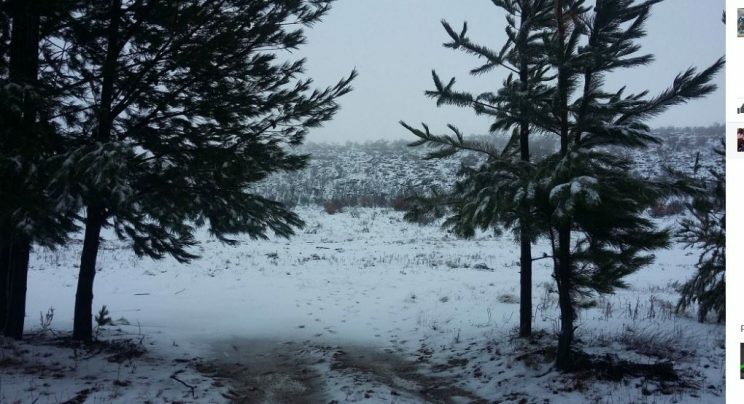 There is also a possibility of snowfalls on the cards for the high-lying areas of the province, while gale-force winds are expected to continue in the interior parts of the province, including the Northern Cape. Maximum temperatures in the Western Cape are expected to peak at 15 degrees Celsius, with Sutherland set to be the coldest, reaching highs of only 11 degrees Celsius. The City of Cape Town advised residents on Wednesday that its emergency call centre was experiencing an “extremely high call volume due to weather conditions”. In a statement, the City said its 0860 103 089 had been inundated with calls as a massive storm hit Cape Town overnight. Residents were advised to make use alternative methods when trying to reach out to the City for water and electricity related matters. Residents were to send an SMS to 31373 for water-related issues like blocked drains and supply disruptions and to 31220 for electricity related faults and outages. “All disaster risk management agencies in the city are on hand to render assistance where needed,” she added. Noël Solomons, a resident of Smutsville, in Sedgefield, said this morning, he assisted authorities in Elandskraal, near the Serenity Care Centre, to bring a raging fire under control, Knysna-Plett Herald reports. This fire is only one of many reported this morning in the wake of gale force winds that hit the province from about 11pm last night. This is according to James-Brent Styan, spokesperson for the Western Cape Local Government MEC Anton Bredell. “The good news is that across the province to date, we have had no reports of fatalities or serious injuries, although some evacuations have been made and a handful of injured citizens taken to hospital by Emergency Services. The injuries were caused by roof collapses,” said Styan. According to Styan, the Western Cape Disaster Management Centre (WCDMC) was activated at the Provincial Emergency Operations Centre at Tygerberg Hospital at 22:00 last night, in advance of the storm, to maximize the protection of the public’s health and welfare and protect critical infrastructure. “Heavy wind and rain hit the west coast of the province and progressed eastwards during the course of last night – resulting in some damage across the province. This took the form of fallen trees, buildings losing their roofs, electricity outages and road-closures,” he said, adding that the closure of the N2 between Plettenberg Bay and Knysna was due to the outbreak of fires. Styan emphasised that the storm has not yet reached its peak and travellers across the province today are advised to do so using extreme caution. According to Veldkornet, the following incidents were also reported. Major concern at De Hoop where staff from the Eden DM fire and rescue service has been fighting a major veldt fire since Monday night. No lives or structures lost yet. The fire in Friemersheim where staff were fighting a fire yesterday has been brought under control, but teams still monitor for flare-ups. Hessequa: At 03:00 this morning Mr. Voss reported that visibility on the Stilbaai road is very bad due to sand blowing in the area. The road has not been closed yet, but they will monitor the situation. Major concern is the fire at Kruisfontein plantation, 13 houses at Springveld to be evacuated and N2 has been closed between Knysna and Bitou. Oudtshoorn: No major structural damages reported yet, Fire and Disaster Management staff will re-assess at sunrise. Bitou: No major structural damages reported yet, Fire and Disaster Management staff will re-assess at sunrise. Cape City’s Disaster Risk Management Centre said some waves would reach 12 metres along the coastal areas of the Cape Peninsula in the midst of a massive storm that made landfall on Tuesday night. Shacks have been blown away, lightning has struck homes and several roads have been closed in the city. JP Smith, mayoral committee member for safety, security, and social services, said this was because the approaching cold front coincided with a spring tide. He appealed to property owners along the Atlantic Seaboard and False Bay coastline to take precautions to protect their properties as there is likely to be flooding. The Disaster Operations Centre were activated on Tuesday night to manage any emergencies related to the weather. The Western Cape education department announced on Tuesday that all schools in the province would be closed in the interest of learner and teacher safety. Once the storm hit, roofs were blown off homes and other damage was recorded.